← Lavish Young Community Dairy & Cheesecake Shavuot Dinner 2018! 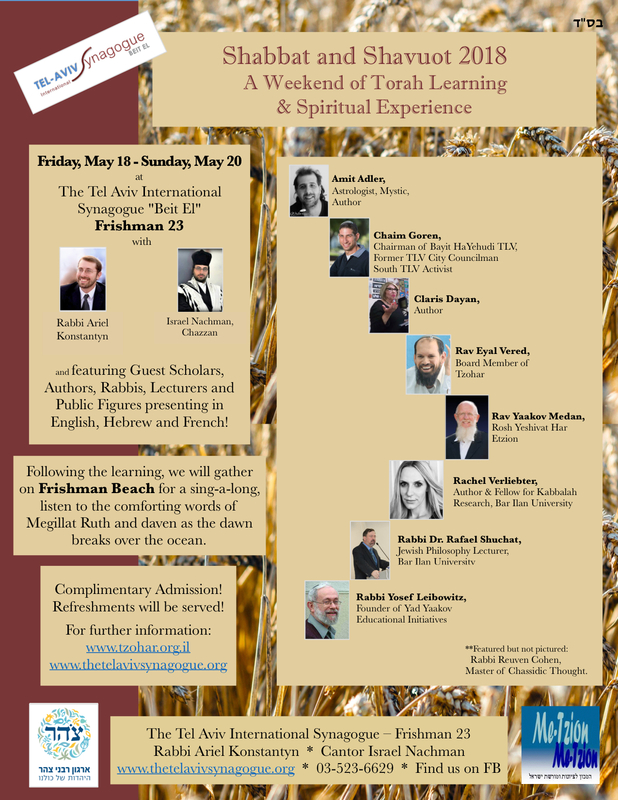 Join hundreds of young Tel Avivians, Olim & Israelis alike, for our riveting weekend of Torah Learning & Spiritual Experience with Rabbi Ariel Konstantyn, Chazzan Israel Nachman and our A-List of Guest Scholars, Authors, Mystics and Public Figures with presentations in English, Hebrew and French!!! Catered Cholent Kiddush in the Shomron Garden to follow generously sponsored by our dear members Lia Lands and Dean Entebbe in honor of their marriage and Dean’s Shabbat Chatan – MAZAL TOV! 8:00pm – Special Festive Tefillah with the Chazz! 11:00pm – 4:00am – All-Night Learning Program in Hebrew, English and French! There’s NOTHING like SHABBAT & SHAVUOT at TAIS!!! This entry was posted in Community, Events, Holidays, Learning, Shabbat, Shavuot, Torah, Upcoming. Bookmark the permalink.